Happy Friday! A little Unity to make the day better! Happy Friday all! It's Friends with Flair Unity Style! Make sure to start from Angela's blog because you don't want to miss anyone. Okay... you don't want to miss an opportunity to WIN some free Unity! Today my Unity Friends I share with you a card using my Unity November KOM. Can I say, I LOVE IT!! The Kit of the Month is a must have and the deal of the century! One amazing kit... NO commitments... and for only $29.95 a month (yes that includes shipping)!!! I was so excited when I received it in the mail on Wednesday. I started a card right away but just wasn't happy with it. Maybe I will go back to it this weekend. I am super happy with this final product. I just love both of these stamps. This girl is just one of the three on the stamp. 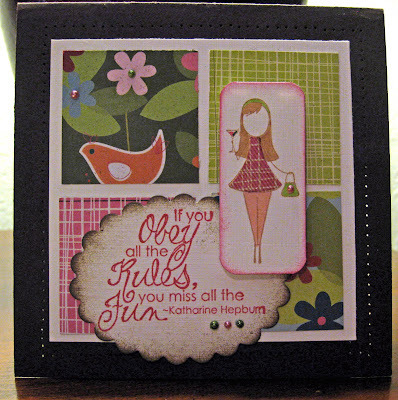 And how about this Hepburn quote; it is way to fun! My layout was inspired from a card that I found in my cards magazine that I am getting online. I used my copics for the coloring (can you see the cute green olives in my martini?). I also used my SU inks for the stamping. I stamped my girl in creamy caramel and the quote in melon mambo. I also used the melon mambo around the girl and chocolate around the quote to add some depth. For her dress I used the same dp as I did for the squares. This is a 5 x 5 card by the way. I pierced holes around the center square for some extra detail and here you have it! I apologize for the poor photo but I am having a hard time taking photos lately. You can see from the the photo that I added a little pearl to purse and some of the flowers and lastly under Hepburn. I really hope you have a great weekend and break a couple of rules while you're at it! Make sure to check out the great 50% off sale going on at Unity! You must go check out Donna Downey's blog for your chance to win some great stuff! Don't wait... head over there!